This article has been tagged since January 2008. This is a list of jargon commonly used by railway enthusiasts / railfans and trainspotters in the United Kingdom, including nicknames for various locomotives and multiple units. Words in italics indicate terms defined elsewhere in this list. Area No 1: A weekly Rover ticket Vaild between Chester, Holyhead, Blaenau Ffestiniog and Llandudno. Very handy for bashing 40's on the North Wales Coast. Area d: A weekly Rover ticket Valid between Portsmouth, Woking, Reading, Basingstoke and Bournmouth. Useful for those on a limited budget to bash the class 33s and later class 50s (Basingstoke - Woking), class 33s (Portsmouth - Southampton) and for a very limited few years class 73s (Bournmouth - Woking) and class 50s (Woking - Portsmouth). And on Sundays only class 33/1s (Reading - Basingstoke and sometimes down to Southampton). There were also Area a, b and c Rovers (broadly Kent and E. Sussex, Sussex, and Surrey and W. Sussex respectively), but these areas had so few loco hauled trains they were largely ignored by bashers. Arkwright: Class 444 EMUs, nickname given by South West Trains drivers after Ronnie Barker's "Arkwright" character in the television comedy Open All Hours because the number 4 is repeated 3 times, often deliberately stuttered by drivers. Baby Warship: North British D6300 class locomotives which used one engine coupled to a hydraulic transmission, making them effectively half a D600 Warship or NBL D800 Warship. Baglett: Bashers term for a young lady! See also Bint. Bail: The act of leaving the train before the end of the run, e.g. "We bailed at Caerphilly and went to the pub for lunch". Bank Insects: Insect bashers at Exeter St Davids station, who were content to scratch a locomotive for haulage by doing the three-quarter mile climb to Exeter Central and then getting off. Basher: One whose object is to travel behind all the locomotives of a given class, and/or to cover as much mileage as possible behind their chosen class; a "track basher" attempts to cover as much of the rail network as possible. Bashing requires far more expense, commitment, time and effort than any other form of rail enthusiasm. Bashers would often do many overnights in pursuit of their favourite class and rack up thousands of miles. See rancid overnights.See West Yorkshire's greatest Basher. Beast: Term applied to a locomotive eliciting enthusiastic approval. Bed pan: a name used for the service that used to operate between Bedford and London St. Pancras; this service has subsequently been replaced by cross-London service on the Thameslink route. Bendy Bus: A Pacer (class 142 or 143 DMU). Bible: The basher's name for the British Rail all-line passenger timetable. An essential (and weighty) tool for the basher who wanted to plan a series of moves to avoid festering on a station platform. Summer 2007 will see the last ever edition (the first was printed in 1974). Boat: Deltic locomotive – because of the naval origins of the power units. Bodysnatcher: Class 57 locos – made by transplanting a General Motors reconditioned power unit and alternator into a Class 47 bodyshell. Term used especially by Brush bashers who have not come to terms with their favourite locos being treated in this way. Bog unit: Diesel multiple unit – derogatory ("bog standard" and basic way to travel). Often abbreviated to 'Boggo'. Can also be 'bug unit'. Bomb: British Rail Class 20 – a nickname for this loud class of loco. A sudden loud burst of thrash from a Class 20 would often frighten the normals, as if a bomb had just gone off. Alternative origin: The loco has a bomb shape when viewed from above: a long narrow bonnet and a single full width cab. Anecdote: A least one summer Saturday train from the East Midlands to Skegness was stopped when a normal over heard two bashers ranting about the bombs on the train. Bouncy castle: Pacer units have only four wheels per coach and consequently very poor ride and body control on anything but smooth, well-maintained track. The bouncing inflicted on the passengers draws comparison with the bouncy castle children's play device. Bowled: An undesirable outcome, analogous to the manner of the similarly disastrous dismissal of a batsman in cricket. See also withered. Examples include: (1) missing a train (if a move, especially a suicidal one, does not come off); (2) an undesired type of traction (often a Class 47) turning up in place of the expected loco; (3) a photo opportunity lost – an enthusiast is about to take a photo of an approaching train and another moving train blocks the enthusiast's view of the subject, sometimes to the extent that no photo of the intended train is possible. Brick: British Rail Class 153 – presumably from the boxy shape of the single-car units. Brush: British Rail Class 47, also known as the "Brush Type 4". Followers of this type are often known as "Brush bashers". Bucket: Class 40 locomotive. When new, these were the first British locos to have on-board toilet facilities for the driver. The alleged unreliability of these devices meant some drivers resorted to other means and methods. Buffer stop kisser: Track bashing taken to extremes. Normally found on railtours covering rare freight lines. Will always be at the front of the train to ensure that as much of the siding has been covered. At other times, travels with map in front of him, often giving everyone a running commentary on former lines and sidings long dismantled to anyone who will listen, and those who would rather not. Bunking: Gaining access to a loco depot without authority. Burger Van: Class 153 single car unit. Burton: The term "Do A Burton" or "Pull A Burton" means to have claimed to have obtained a train number without actually seeing the locomotive involved. In some regions the term Cabbager is used (see below). Such behaviour is usually frowned upon within rail enthusiast groups. Train spotters who resort to this are often given the cold shoulder by other rail enthusiasts. Cabbager: Someone who claims to have seen something they haven't. Calendar: Nick-name for Class 31 diesels. Refers to the fact that they were very sluggish in acceleration and therefore speedometers were replaced by Calendars, which were better able to record the speed! Caped: The unexpected cancellation of a train that was booked to run. Initially CAPE was the BR telegraph code for "Cancelled At Point of Entry" but more recently is used to describe any kind of cancellation. Can: General name given to the 100 Class 86 AC electric locomotives built between 1964 and 1966. Cart: Slang name for a rancid Diesel Multiple Unit. Chippy Move: the name given to a move to get some chips after a good bit of bashing, usually what most bashers lived on! Chopper: Class 20 locomotive, either from the engine sound or because the single cab design gives a "one end bigger than the other" appearance bearing passing similarity with the Chopper bicycle design. Chuck-out: Refers to the indifferent diagramming of a Diesel or Electric locomotive for a train, i.e. whatever is available. Clag: A term describing the often spectacular(especially blackened, as in Class 37 or whitesmoked, as in Class 55) exhaust emissions of many older British diesel locomotives, especially Classes 52 and 55. Clag bomb: a plastic bottle, usually filled with reclaimed motor oil, introduced at intervals into the firebox of a steam locomotive so as to produce enhanced exhaust effects for the benefit of lineside photographers. Clayton: Class 17 locomotive, manufactured by the Clayton Equipment company OR may refer to Clayton brand of boiler providing steam heat. Clingdect or Clingon: A clown or insect who befriends you over and above the rules of social normality, and proves impossible to shake. Clown: A basher who doesn't have much idea of what he's doing. Also applied to a slow or unskilled train driver who can't keep time. Coast: The North Wales Coast Line from Chester to Holyhead. Coffin: Applied to the first air conditioned mark 2 coaches which came with sealed windows (viz. sealed inside a coffin) in the passenger saloon. A locomotive enthusiast enjoys leaning out of the window (ideally not far enough to foul lineside structures although some serious injuries and deaths have been caused from over-enthusiastic leaning-out) to hear the locomotive working more clearly. Coffins deny this pleasure and a rake of coffins on an enthusiast special train is likely to provoke adverse comment from those who pay good money to travel on such a train. Also can refer to the Class 158 DMU which is loosely based on the Mark 4 Coach and shares the sloping sides, the outline shape when viewed from the front is like an upsidedown coffin. 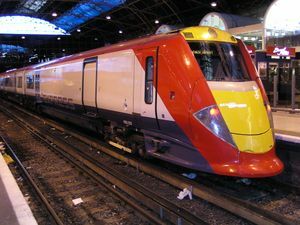 A current use of the term is for the British Rail Class 390, due to its cramped interior and small windows. Coffin Nails: Refers to the British Rail Class 153 because when you get these on your branch it is a sign that it is in danger of being shut. Cooked: A term to describe a loco which has suffered an engine fire, ie cooked the insides. Cop: First spotting of something. Crank: Affectionate term for a fellow railway enthusiast. Cranking: Obtaining pleasure in a railway orientated situation. Crompton: British Rail Class 33 locomotive (fitted with Crompton Parkinson electrical equipment). (Also see Hastings Unit and Slim Jim). Cyclops: Class 67 (single-pane windscreens). Daddy Yings: name given to the Class 59 owing to the ying-ying noise they make when idling and that they are the original design on which the Class 66 was later based. Darth Vader: British Rail Class 460. This refers to the nose shape which in the opinions of railfans resembles the mask of the Star Wars villain Darth Vader. Demic: a general purpose description for a locomotive, carriage or other item of rolling stock that is unservicable, or in a poor state of repair/vandalised/robbed for spare parts or generally fit for scrap. Origin of this term is unknown, although may refer to "Demi-condition", i.e. not in condition. The Desert: The Taunton – Reading route, so called due to its lack of lineside features. Desperado: An obsessive individual (who may be a basher, spotter or ned) who will go to great lengths or excessive expense to achieve their aim. Often seen by others as irrational or weird. Desperation index: A method of establishing how desperate a basher is. For example, a basher making a round trip of 500 miles to travel only 10 miles behind a required loco has a DI of 50. Anything above 100 indicates a real 'desperado'. Dogbox: A Class 153 single car. Name refers to the very small new cab created during the conversion from the 2 car Class 155. Door to Door: It was sometimes possible to change trains by opening the slam doors on the non platform side of adjacent tracks, in stations or on occasions yards, and jumping from one train to the other. Doodlebug: Siemens Desiro unit. From a nickname for the V-1 flying bomb - The Desiro is German-built and in their earlier days were prone to blowing up (failing) without warning. Also a lesser known name for Class 153 railcars - as with the V-1 flying bomb, you're quite safe until the engine cuts out, and then you should start worrying. Doughnut: British Rail Class 60. The grille arrangement allows an observer to see though the engine compartment and out the other side. This unusual arrangement gave rise to the saying "if you can see through it - don't do it!" Dreadful: Exclamation denoting enthusiastic approval. Duff: A British Rail Class 47. From the general slang use meaning "no good", from the time when Class 47s were so widespread as to be thoroughly uninteresting (it being the most numerous class of diesel loco on BR), or possibly due to early reliability problems of the class. A 47 turning up in place of the hoped-for traction became known as "duff gen", meaning unreliable information. Dusty Bin: A Class 321 EMU. Refers to the losers prize in the 1980s TV programme "3-2-1". Dutch: The livery of British Rail Civil Engineers, due to the resemblance of Nederlandse Spoorwegen's corporate livery. Dyson: A Class 92 AC/DC locomotive. Refers to the sound made by the locomotive's cooling fans. Egg Timer: Class 58 locomotive. Euro Ned: A British haulage crank who just can't accept that loco-hauled service trains are virtually finished in the UK. Instead the Euro Ned will spend many weeks desperately scratching foreign locos in Europe. F: To travel without a ticket - see "NV"
Fag packet livery: the original livery of the First Great Western HSTs – a basically green colour scheme, fading to ivory, with shiny gold stripe, below the windows (see photo). Father Shed: name for the Class 59 as these are the original design on which the Class 66 was later based, also known as daddy yings. Flying Banana: Originally used to describe the first design of GWR diesel railcars, introduced in 1932, whose body shape and smooth lines somewhat resembled a banana. More recently, the term referred to the large areas of yellow on the original HST livery, particularly on the Western Region. Current use is to describe the New Measurement Train (a bright yellow converted HST). Four Slide Slide: Name given to Southern region suburban Class 455 Units - one little rain droplet on the track results in frequent wheelspin. Fraggle Railway A term applied to the South Western division of the Southern Region, usually by the South Central and South Eastern staff as a derogatory description. Named after the 1980s childrens programme Fraggle Rock. Gen:Comes from the term "General Information", most particularly regarding locomotive movements and what might be working a particular train. The rise of the mobile phone and internet communication has made modern gen more long-term and less distinguishable from general rumour. GM: General Motors design locomotives such as the Class 59 and Class 66. Either a neutral term or, by allusion to genetic modification, a negative connotation (especially the 66s, which displaced many well-liked native British locomotive classes). Goodly: A good 'haul' or large number. for example, "got a goodly haul on the Milford Haven today." Goyle: A British Rail Class 31; from "gargoyle" (the somewhat ungainly headcode boxes above the driving cabs). Gricer: - an old fashioned name for a rail enthusiast. The derivation is much disputed; one theory is that it comes from Richard Grice, a trainspotter who became legendary for having travelled the entire British Rail network. Gronk: A Class 08 Shunter From the sound of the motion - gronk, gronk, gronk. Hastings unit: Visibly thinner versions of the Thumper DEMU sets that were built to a special loading gauge to cope with a particularly narrow tunnel on the Hastings line. Also applied to the narrow-bodied Class 33/2 sub-class of locomotive, built for the same line. Heinz: Class 57 locomotive, of which several ("57") varieties have appeared. Hellfire: Particularly noisy and/or smoky locomotive, though also applied to one in good mechanical health but being worked hard. For example "That little Class 27 slogging up the gradient was hellfire!" Generally taken as a term of enthusiast approval. Hoover: British Rail Class 50 (Sound of the engine cooling fans being similar to a vacuum cleaner, prior to refurbishment which removed this characteristic; also vacs). HD-HST: Reference to the new High-Density pool of First Great Western refurbished InterCity 125 High Speed Trains. Hymek: D7000 class locomotive using a V16 Maybach engine coupled to a Mekydro hydraulic transmission. Insect: 'Infestation' found at the end of station platforms. Also applied to the huge numbers of young bashers who appeared in the 1980s after many of the rateable locos started to disappear. Invade: On a packed train of compartment stock, for a group of bashers to occupy the remaining seats in a compartment otherwise occupied by normals, or vice versa. Jaffa Cake: a grey, amber and dark brown striped livery applied to some Southern Region units. Kit-kat: The predominantly red livery used by Virgin Trains on its older stock; from the wrapping of the Kit Kat chocolate bar. Large Logo livery: one of the first new locomotive liveries applied after many years of all-over rail blue. For this livery, the loco cabs were entirely 'warning yellow', with black window surrounds (the yellow usually wrapping round behind the cab doors); the main bodysides were still rail blue but featured very large running numbers (about a foot high?) with an enormous white British Rail 'double arrow' in the middle, the full height of the body, hence the name. It was applied to refurbished Class 50 locomotives, among others. Leap: A basher would often 'leap' from a train as it came to a halt at the platform and run to catch another train which was waiting to leave (a suicide or minus 'move' ). Leaps were usually of short duration, but longer runs were not unknown, such as between Glasgow Central and Queen St. stations to catch the 23.30 'overnight' to Inverness. If time was really tight it might be described as a desperate leap by a man of steel. Log: Class 50 locomotive – so-named either due to the class's unreliability (i.e. "still as a log") or because of its long and square-ended body shape. Man of Steel: - refers to a basher who attempts to make a very tight train connection which will end in disaster if the connection isn't made. May also be a dead connection or indeed a minus suicidal move (the next train is scheduled to depart before the first train arrives). If the move fails the basher will be bowled and withered. Then he is likely to be described as a clown by his fellow bashers. Marches: Sometimes known as the Welsh Marches or the "North and West". The stretch of line running along the Wales/England border from Newport to Shrewsbury. Metrovick: British Rail Class 28 (D5700 class) Co-Bo locomotive, constructed by Metropolitan-Vickers. Minus-move: Theoretically arriving at a station AFTER the connecting train or train you wish to board should have left. Monster: Term applied to a locomotive eliciting enthusiastic approval. More emphatic than beast. Moose: A Class 20 – from the long narrow moose-like nose of the Class 20. Positioning moves entail using a neutral (e.g. HST) or actively disliked type of traction, as a means of getting to a station or other location where a desirable form of traction may be taken. Winning moves result in the desired outcome, e.g. a new loco scratched. Suicidal moves are those with very tight (ideally, non-existent) connections but with the potential for high reward should they come off (usually because the incoming train is running late). A series of successful suicidal moves may result in the person who successfully undertook them acquiring some bragging rights. Fill-in moves use otherwise-wasted time productively. Moves Book A bashers record of moves made. Ususaly including mileages. The Mule: The Exeter - London Waterloo route. "My Lords! ": An exclamation favoured by bashers when travelling behind a hellfire or dreadful loco, especially when loud thrash and clag are involved. Often (but not always) accompanied by arm flailing. NB: Abbreviation of "no boiler". Originally just that: a (diesel) loco not equipped with steam heating apparatus. More recently, any loco with no train heating equipment of any kind. NB locos would normally be used on freight services, although they did appear on 1970s and 80s summer weekend passenger services when they weren't needed for freight and the lack of train heating was unimportant. The "hard to get" aspect of NB locos made them more rateable and an NB scratch could be highly prized. NED: An acronym for "new engine desperado". A person can be referred to as a NED if they go out for new engines or rare movements exclusively. Normal: A non-crank person who has the (mis? )fortune to find themselves travelling on a loco-hauled train in the company of bashers. Can also be a dismissive term for any non-enthusiast. Nose: A more recent term to describe the Class 37 locomotive, built by English Electric. It refers to the classic 'bonnet' in front of the drivers cab, the only class with this bodyshape still in regular service. NV: Not Valid " My tickets is NV after Chester so I f'd it to Crewe"
Oil Slosher: Derogatory term applied to Western Region diesel hydraulic locomotives. Over-Doss: To miss one's stop by being asleep. Peak: British Rail Class 44, Class 45 or Class 46, so named because the earliest of these loco types, the ten Class 44s, were named after mountains. Ped: A Class 31, comes from their low power i.e. pedal car, mo-ped or pedestrian. Phot Photograph, or the act of photography "I'm off to phot the loco"
Photter: An enthusiast whose main interest was photographing trains. Pig (Plastic Pig): Class 442, The name given by Railway staff to the Wessex Electrics. Reputed to have come from the Wessex Saddleback, a variety of Pig, with the 'Plastic' coming from the stuck-on plastic cab. Alternatively, the name Pig was first coined by John (Scumbucket) Stonestreet : "It looks like a Pig!" Term also used by train drivers P.I.G. as in "Passengers inconvenienced generally"
Proper train: one with a locomotive (on the front) - i.e. not a unit. HSTs may or may not be proper trains depending on individual opinion. Rancid: Exclamation denoting disapproval. Also "rancidity". Rancid Overnight: As recently as the 1980s, there were a large number of overnight passenger trains in Britain which were often hauled by rateable (huge) locomotives. Dedicated bashers would forgo the luxury of a bed for many days on end in their desire to rack up the miles. Often bashers would leap at an obscure shack in the middle of the night, at places such as Taunton, Doncaster or Blair Atholl. The reason for this was to stay warm and try to sleep on the train while completing a planned move. Unfortunately these moves soon led to the basher being almost constantly comatose (sleep deprivation) and starting to smell somewhat rancid. Even worse, if the basher's hair and face were covered in the residue of clag from diesel locos they would often frighten the normals. Indeed after six consecutive overnights a basher could closely resemble an oily tramp. Rat: A British Rail Class 25 or related classes, reputedly originating from a term used on the LMR of British Rail in the 1960's where 25's were as common as "rats"; the Scottish-based Class 26 and 27 were sometimes known as "MacRats". In their heyday, these locomotives were very widespread on the British railway network and, like the rodent, one was never far away. Roadshow a large group of bashers travelling together. Roarer: Early 25kV AC electric locomotive of Class 81 to 85, so called because of the loud cooling fans. Rover Brain: A consequence of doing too many Rancid Overnight's and being unable to make decision. Run round: The practice of detaching a locomotive from its train, driving it to the other end of the train and re-attaching it, to allow the train to proceed in the direction it has just come from (e.g. when it reaches its destination and forms a service in the other direction). The cost (owing to the need to employ specialist staff to perform the dirty task at track level of detaching and attaching the loco, plus the dedicated track layout required) and complexity of this simple-sounding manouevre is one reason why loco-hauled trains are now scarce in the UK. Score/Scored: The term for a needed loco seen, and no longer required. Scratch: The action of crossing off a loco in a spotting book, either because one has seen it or had it for haulage. Screeching Banshee: Name given to British Rail Class 142 DMU's, due to the screeching noise generated by their wheel flanges as they negotiate anything other than straight track. Screamer: Given to InterCity 125 HST powercars of Class 43 from the turbo howl - less common as powercars receive new and quieter MTU engines. Scud: Class 153 unit. Allusions to scud missiles (you're fine until the engine cuts out - modern British Rail "sprinter" diesel multiple units have all coaches powered with one engine - if one fails the others can keep the train moving; the 153 being a single car unit removes this advantage). This nickname is also applied to Class 158 DMU, and in the West Midlands to the prototype Class 150 DMU Sprinter unit 150 001 . Shed: A Canadian built Class 66 locomotive (from the roof shape and also the corrugated bodysides). Shedbashing The practice of visiting as many motive power depots as possible in one trip in order to record the locomotives on shed. In less security-conscious days, this was not always done with the knowledge of those in charge. Shoebox: Class 73 locomotive (from the boxy body shape and third rail pick up shoes required for operation on the Southern Region). Shoves/Shove Duffs: Class 47s 47701-47717, modified in the 1970s for use on Edinburgh-Glasgow shuttles via push-pull control to avoid the need for running round at the end of each journey. Shredder: British Rail Class 33 locomotive, primarily West Country term. Possible derivation from the 'sha-sha-sha' exhaust sound. Skinhead: Term for one of the small number of Class 31s built without roof-mounted headcode boxes, particularly members of the 31/0 subclass. Skip: Class 67, from the body profile which looks like an inverted rubbish skip. Skoda: British Rail Class 90 - Styling reminiscent of a 1980s Škoda. Slammer: Slam door stock, in particular Slam Door EMUs. Slapper: InterCity 125 - Referring to the slam door rake of Mk. 3 coaches. Slim Jim: Narrow-bodied version of the British Rail Class 33 – built for the confined loading gauge on the Hastings line. (Also see Crompton and Hastings Unit). Snail: British Rail Class 31 - from its lack of power (also Ped as an abbreviation of "pedestrian"; "Rancid Peds from Immingham shed"). Spearmint Polo: British Rail Class 175 - The new Arriva Trains Wales 175 livery is a Spearmint Polo or a TUBE of Polos when 3-car and coming towards you. Spoon: Class 47, deriving from the high-pitched two-tone horn sound: onomatapaeically "Spoo-oon!" Spoon Goon: Derogatory nickname for the followers of Class 47s. Spotter: A person who writes down train numbers. Spuds: appled to 37515 after it hit a lorry carrying potatoes near Gleneagles in January 2008. Stalker: A loco that appears to follow you around, wherever you go. For example, "Not 60042 again, that stalks me." Stealth Bomber: British Rail Class 91 - High speed, quiet and with dark blue GNER livery (also the associated passenger coaches that the 91s usually haul). Stoat: Term used to describe the more vile of the stereotypical rail enthusiast. Strummer: British Rail Class 47 - West Country term. Strumbowly: British Rail Class 47 See above; due to its ubiquitous nature, the Class 47 could turn up at any time on any other (and preferable) locomotive's working diagram, thus bowling the expectant and waiting Class 31/37/45/50 enthusiasts. Sunflower: The AWS in-cab visual warning panel. Super Skoda: British Rail Class 91 - similar styling to the Class 90. Teddy Bear: Class 14 diesel-hydraulic locomotives for shunting and trip-working. coined by Swindon Works' foreman George Cole who quipped "We've built the Great Bear, now we're going to build a Teddy Bear!". Thousands: Class 52 diesel-hydraulic locomotives (the "Westerns") given the number range beginning with D1000. Thrash: The noise made by many classic diesel locomotives, often very distinctive and loud. Best appreciated by bashers from the window of the front coach, often accompanied by lots of clag. A loco which is thrashing loudly is usually hellfire or dreadful! Best experienced when a locomotive hauls a heavy train up a long gradient such as the Lickey Incline. Thumper: Southern DEMU - unlike conventional DMUs these used a single, comparatively large engine mounted immediately behind one driving cab. The power units made a distinctive "thumping" noise when working hard. Toffee-apple: name for the early British Rail Class 31 ("Brush Type 2") diesel locomotives, from their control handle which resembled a toffee-apple. Tram: Original nickname for a HST set, particularly on the Eastern Region (possibly from the frequency of services operated by these units, also the double-ended design means one cannot immediately discern the direction of travel from a static shot). Tugs: British Rail Class 60; a heavy freight design with very low gearing that can haul immensely heavy trains. Vac: British Rail Class 50 locomotive - see Hoover. Van: British Rail Class 87 General name given to Class 87 AC electric locomotives built from 1973. Veg: Groups of rather unpleasant-to-the eye spotters. Vic Berry's Scrapyard: A scrapyard in Leicestershire, many locos met their fate here. Made famous for the fact that it stacked the bogie-less shells of the locos awaitng disposal. Vomit Comets: Virgin Voyager units, allusion to NASA astronaut-training aircraft used to simulate zero-g. The Voyagers replaced popular loco-hauled trains and the nickname also implies the feelings many enthusiasts have for them. Val: The old Paxman Valenta engines on the Class 43 HSTs. Wagons: British Rail Class 44, Class 45 or Class 46, sturdily-constructed designs with four axle bogies to spread their weight: "Sixteen wheels on my wagon". Warship: D600 or D800 class locomotives, most of which were named after Royal Navy vessels. Washing machine: An electric locomotive. Wedged: A full or nearly full train. West Yorkshire's greatest Basher: Brendan Kilgallon. b.01.11.1963. Bradford. Known as one of the Brad twins. Area of speciality being sulzer type 2 diesels eg Class 25 Class 26 and Class 27. Western: British Rail Class 52. Twin engined WR diesel Hydraulic type 4 developing 2,700bhp, 74 of which which ran on BR between 1961 and 1977. All were named in a series beginning "Western..." and they developed a great following before their premature scrapping. 7 of the class have been preserved. Whistler: British Rail Class 40, from the turbocharger sound. Withered: A basher will be utterly withered if 1) the expected loco doesn't turn up, or 2) if circumstances conspire to make him miss a rare engine which has worked, or 3) if the loco fails or is taken off before he can travel behind it. This could be the case if the basher doesn't have the 'gen'. This used to be an occupational hazard of bashing - now it's quite rare on service trains as there are almost no locos left to bash! A basher may also be 'withered' by the insults or ridicule of other bashers. Worst or WorstGroup: derogatory nickname for FirstGroup, especially on First Great Western ('Worst Late Western') because they are often lambasted for their poor performance, delays, overcrowding and cancellations. Yeoman: Early name for a Class 59 locomotive, the first privately-owned locomotives to operate on British Rail, owing to their distinctive silver Foster Yeoman livery. Ying Ying: Describes the sounds made by a General Motors Class 66 locomotive when idling. Usually derogatory, as the sound of the diesel power unit itself is so muffled in comparison. Zing: An older term for British Rail InterCity 125 High Speed Trains of classes 253/254 – from the sound of the power cars as they speed past. ↑ 1.0 1.1 1.2 Class 33 locomotives. Southern E-Group (SEMG). Retrieved on 2007-02-16. This page was last edited on 23 January 2008, at 23:49.